As the cities in India expand creating more traffic jams, the age-old tradition of transport– elephants and their masters, are squeezed between cargo trucks, taxis and motor scooters down the narrow streets. Sixty percent of the Asian elephant population is in India; therefore saving the species is dependent on their survival in India. The elephant’s natural habitat is getting smaller as the farmlands and cities grow larger putting the entire ancient species at risk. The Wildlife Trust of India has partnered with conservative groups to secure eighty-eight ‘vital corridors’, which has been identified for the safety of the elephants movements. The local communities and governments will be involved in the process. Auctioning off the emerald jeweled collection by Sotheby’s at the Taj Mahal Hotel in Mumbai on October 14, 2011 will raise the funds required for producing the safe corridors. 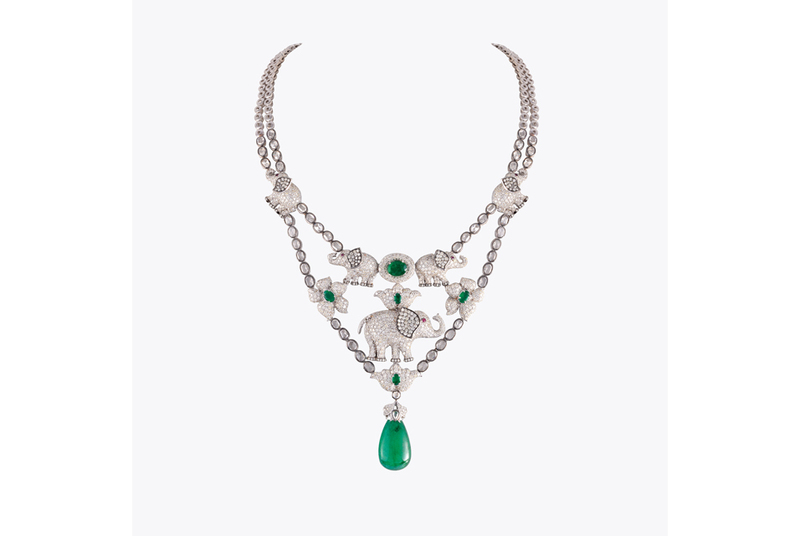 The percentage of profits from each jewel goes towards the World Land Trust’s Indian Elephant Corridor project. The emerald jewels to be auctioned off were created by ten of India’s jewelry designers. Arzan Khambatta, of Khanna Jewelers created the shown piece with 638 carats of Zambian emeralds. The World Land Trust in partnership with Gemfield Mining, Jaguar Land Rover and The Gemological Institute of America are working together for raising not only the needed funds, but also bringing awareness to the “Indian Elephant Corridor” project.